I was surprised when i open my email folder, Lainy of Lainy Online sent a special mail to me, it's a Letter of Commendation!.. Thanks Lainy and Windmill, I really appreciate this recognition. 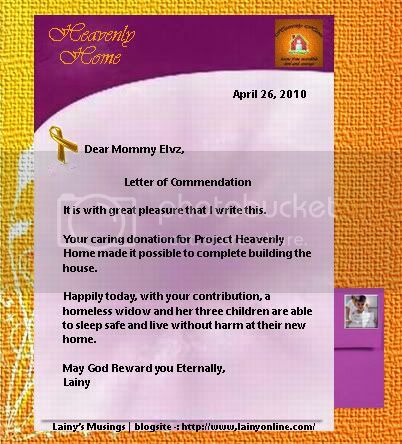 By the way, Project Heavenly Home is a charity work of Windmill with Lainy's help and coordination. Congratulations to your success! I haven't heard of this project. Maybe next time I could help in my own little way too. By the way, delivering a tag. Hi Mommy Elvz. I apologize for my delayed visit here. I haven't been around since the Automated Elections. Thanks Mommy Elvz for this post. Being a part of this philanthrophic project deserves commendation and more. I hope more and more good hearted people like you will support endeavors of this kind.